I love, love, love it … it goes to 11ty!!! Thank you to the friends, family, and especially to HH6 for this gift. There are a couple more things over at Ranger UP! I wouldn’t mind owning. That Devil Dog brew coffee package looks mighty tasty. Good thing I already got a regular shipment coming or I’d have to pop for that one too. 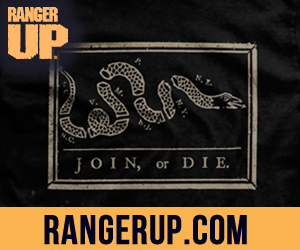 Got over to Ranger UP! and git some kewl shiite! (dang, this sounds like one big gay commercial or something … what’s wrong with me!?!) When you’re done spending money on their junk … tell ’em they NEED to be carrying the Delta Bravo Sierra cartoon on their site. K? Hooah! !